Healthy meal ideas are the easiest to create in the good ‘ol summertime with the abundance of farmers markets and opportunities to grill outside. As long as you walk quickly past the dessert booths, you can usually pick up just about anything at a farmers market and use it as inspiration to create a healthy meal. Using the grill, providing you don’t burn foods, is an excellent way to prepare recipes without adding in oils. Yet, any time of year is the right time to cook up healthy meals! So, here are nine ideas to help with making healthy meal choices in your house all year long. The idea of healthy meals is a bit of an open ended subject because what may seem healthy to one person, may not be that great for another due to individual health restrictions. That said, we are going to generalize and point out healthy meal ideas that are considered healthy for the masses. Here are some healthy meal ideas to try, just click on the recipe underneath the picture to be taken to the recipe website. Move salads from the side into center stage as the main attraction for dinner simply by adding a low fat protein. This avocado chickpea salad recipe, also from hurrythefoodup.com (who have a lot of great vegetarian recipes BTW), is full of protein from beans and looks super appealing on a plate or in a bowl. Substitute vegetables for your pasta, try spaghetti squash or make zucchini strands. This Zucchini Shrimp Scampi recipe even looks prettier than the traditional shrimp scampi dish. Pack your own lunch when working or traveling, like these beautiful salad jars. Follow this Salad Jar recipe and then shake them up when you’re ready to eat – the veggies actually stay crisp! Make one rotisserie chicken last for several days, Instead of making chicken the main meal – shred it up to make 3 different meals from one bird. For instance, make white chili, chicken caesar salad and then boil the bones for soup… 3 meals, one bird. Get to know tofu, even on the grill. This tofu kabob recipe won’t leave anyone wondering “where’s the beef?”. 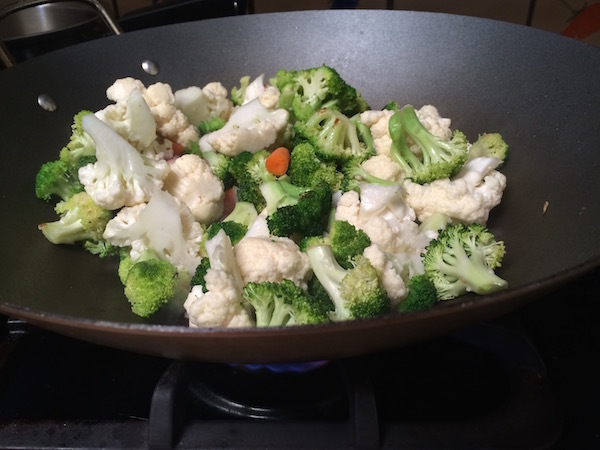 Get a wok and learn to stir fry. With the proper choice of a wok and stir-fry basics, there’s a whole world of possibilities out there. Forget about the bun or tortilla – opt for lettuce instead! Lettuce can easily replace a hamburger bun, especially if you follow our directions to make crisp lettuce. Crispy lettuce will even add to the experience by giving a crunch instead of a mush to every bite. Also pay attention when eating out because many restaurants, like In-N-Out, will do this swap for you. Substitute vegetables for your pizza crust. That’s right – pureed cauliflower can be used as a fake-out for rice, potatoes or even pizza dough! This cauliflower pizza crust recipe can be topped traditionally or with even more veggies. Try different whole grains, most people are amazed at all the options. This Thai Barley stir-fry recipe is one of many listed on the whole grain website. To make quick work of turning veggies into noodles, try one of the following options. The first two options are if you’re serious about the process and the third is a hand held model that won’t take up as much space. When using vegetables, don’t forget that frugal is fashionable. For easy to make healthy sweets (we know that may sound like a double negative, but some pretty tasty ones actually exist), see our healthy snack post.